We can fight climate change by helping make the Hudson Valley a leader in clean energy. This can create new jobs, provide reliable and affordable energy, and shape healthier, stronger communities. Gov. Cuomo and New York State agencies have adopted important policies to transition the state to a 50-percent renewable energy supply, reduce fossil fuel emissions and mitigate climate change. Now we need to ensure that the development of solar energy projects in the Hudson Valley is maximized, while protecting the region's priceless natural resources, scenic views and historic sites. The Hudson Valley can serve as a regional model of how to respond to climate change by promoting renewable energy development to meet state goals, while simultaneously preserving important natural and economic resources. Significant time, energy and funding have been expended to protect the irreplaceable natural and economic resources that make the Hudson Valley a great place to live and work. These assets now face their greatest threat ever—from climate change. Hudson Valley residents will be impacted by changing temperatures, shifting weather patterns, and sea level rise along the Hudson's shoreline. To help mitigate climate change, New York has adopted ambitious policies to reduce greenhouse gas (GHG) emissions 40 percent from 1990 levels by 2030, and 80 percent by 2050, with an additional goal for New York to get 50 percent of its electricity from clean, renewable energy supplies by the year 2030. These policies will transition the state’s energy supply away from a system of large fossil-fuel power plants and long-distance transmission and toward a central energy grid with clean, locally generated power. We can have large wind and solar farms and smaller-scale projects, such as community solar farms and rooftop solar. Solar power is the renewable energy technology with the most potential for increased development in the Hudson Valley. Because it is so scalable, solar energy projects come in many shapes and sizes. Like other types of development, large-scale solar facility construction, if poorly sited, can damage our environment and the valley's natural beauty. Use of proper siting and design and construction best management practices can avoid, minimize and mitigate any effects on important natural resources, scenic views, historic sites and community character. Under these principles, areas with high conservation, agricultural, ecological and cultural value should be avoided for development. Instead, low-conflict sites and areas—such as brownfields, previously disturbed and developed lands, or closed landfills—should be identified and prioritized for use. Projects can be sited and designed to minimize impacts to areas of natural beauty by avoiding designated scenic areas, keeping below tree lines and including robust vegetative screening. 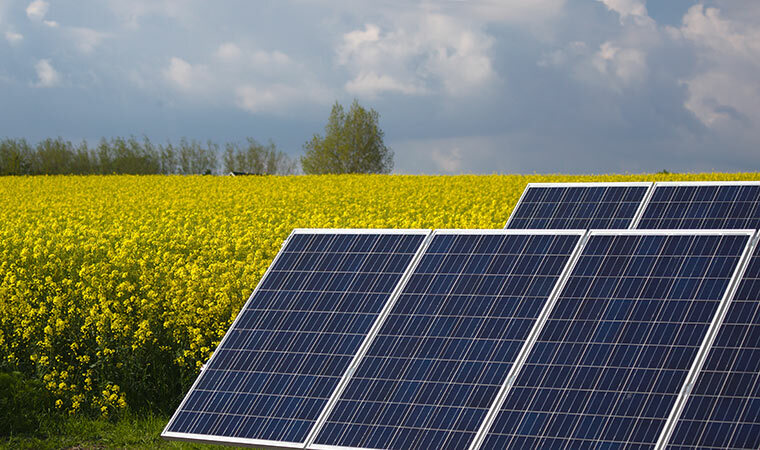 Opportunities should be pursued to achieve dual-use, or co-location of solar energy projects and other uses, such as pollinator-friendly plantings, livestock grazing or crops. Developers must be sensitive to local values and community concerns and take them into account when selecting sites and planning a project. Involving the public early and reducing conflicts from the start is extremely important for minimizing the amount of time, costs and complexities of environmental analysis during project review. And very importantly, municipalities must proactively plan for how they will help achieve renewable energy goals through comprehensive plans and zoning and other local laws. In March 2018, Scenic Hudson published a downloadable llustrated guide that includes details on these siting and design principles. Our sold out spring 2018 symposium featured interactive discussions and presentations that explore important questions and tough issues surrounding the rapid development of solar energy projects in the Hudson Valley. Key topics included the state policy and market forces that are driving renewable energy development; maximizing renewable energy development through planning and zoning; reducing public opposition; developers’ responsibilities; responsible building of renewable energy on farmland, conserved lands and previously disturbed areas; and how to develop a regional renewable energy plan. Scenic Hudson participated in the Renewables on the Ground Roundtable in 2017, which brought together diverse stakeholders to develop a set of principles and policy recommendations to reduce barriers to large-scale renewable energy siting while mitigating impacts on the ground, and help meet New York’s ambitious goals through the responsible development of clean energy. Led by Alliance for Clean Energy New York and The Nature Conservancy and facilitated by The Consensus Building Institute, the Roundtable included many non-traditional partners, including land use planners, environmental organizations, conservationists, renewable energy developers, agricultural interests, utilities, regulators, and government officials. The Roundtable produced a report in October, 2017, Accelerating Large-Scale Wind and Solar Energy in New York, which sets forth recommendations for action by various state agencies and others which are meant to eliminate hurdles and help accelerate renewable energy development in a sustainable manner. 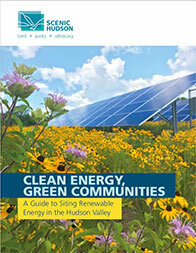 Scenic Hudson’s Clean Energy, Green Communities: A Guide to Siting Renewable Energy in the Hudson Valley is intended for citizens, community groups, environmental organizations, land trusts, local conservation advisory commissions as well as municipal boards, regional planning groups, energy developers and other stakeholders. Download the free 28-page guide and learn how to reduce conflicts from the start and encourage collaboration to accelerate clean energy capacity in the area.